Striking the perfect balance of beauty and comfort, country French style easily fits into elegant homes and country houses alike. Beautiful fabrics and provincial patterns are hallmarks of country French style. 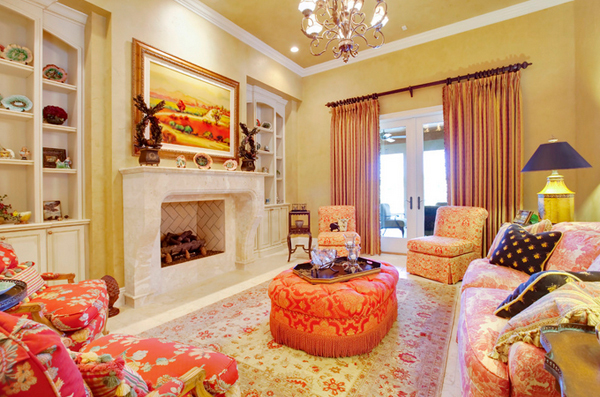 To balance today’s hectic lifestyles, softer colors and more delicate patterns have become popular choices. Pretty fringes, decorative trims, and lacy accents add an elegant finish. 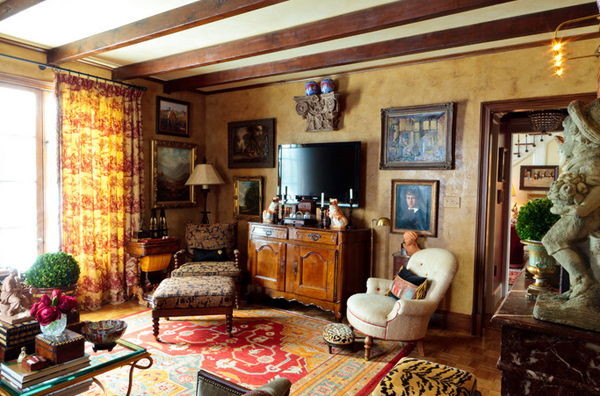 Architectural details that harkens to yesteryear easily give a room country French flavor. But you don’t have to live in an ancient chateau to create the look. Rustic stone tile and hand-scraped wood beams add the charm of an old French eatery to this new kitchen. 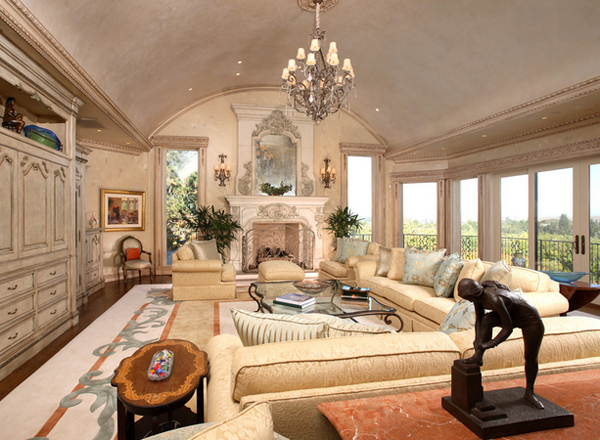 Curved archways, intricate molding details, and painted finishes also enhance the look. Check out the pictures below. 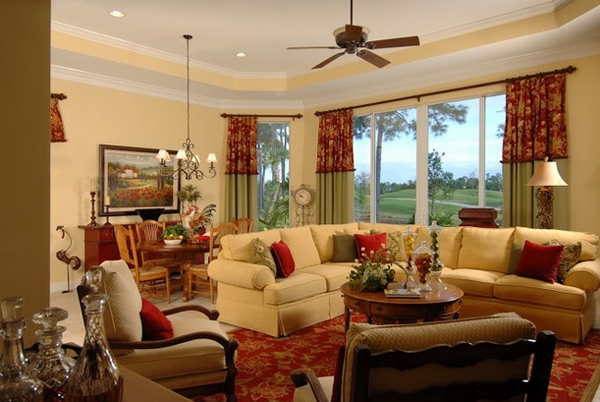 The use of greens in this living room makes it really pretty. Note the lovely limestone fireplace. 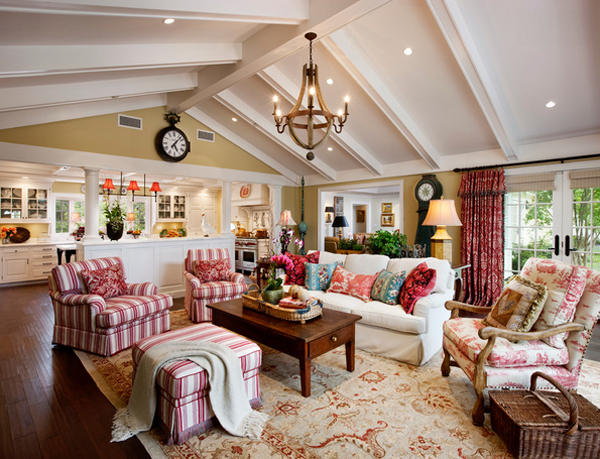 I love the rich colors and beam ceiling; this is more of a den and not so much formal living room. 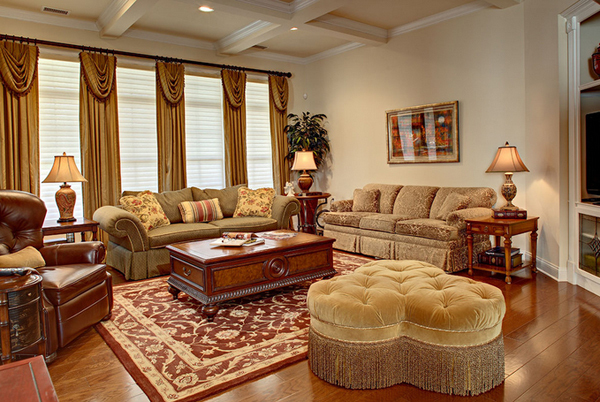 Rooms that work best with two sofas are often a bugaboo when it comes to the coffee table. If you place it close enough to one sofa to function well, it will be too far from the other. A great solution is to use two ottomans. The colors used here are soft. I especially like the shades of cool taupe. The distressed paneling on the doors is stunning. The color palette is shabby chic and super classic! Long and low baskets. Perfect for storing books and magazines when you’ve run out of shelf space, long, shallow baskets can slide beneath tables, couches and beds with ease. This French-country home looks really feminine and happy – do you like it as much as I do? Interesting drapes make room cozier. Light fixture over dining table. Furniture is designed for comfort, including an ottoman with a plush outer edge for propping feet and a firm center that serves as a table surface. 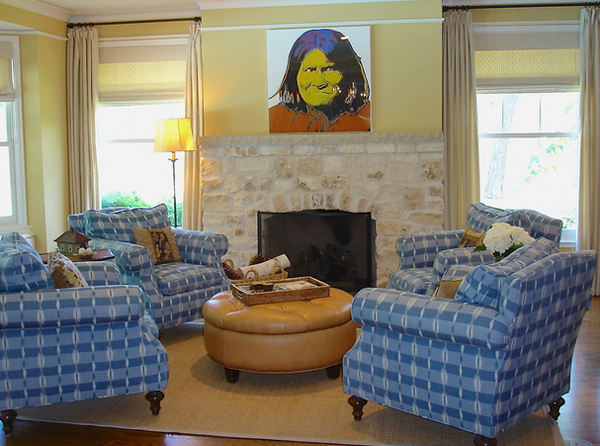 I like the stone fireplace, especially the artwork above it – very interesting and beautiful. 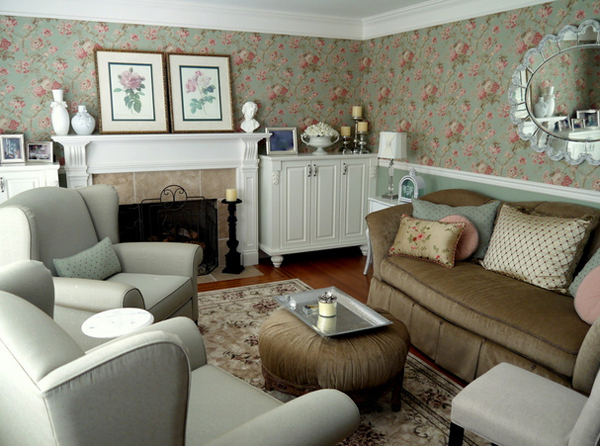 Love the color scheme; chair upholstery and the picture above fireplace. I love this French country theme. It’s very inviting, clean and charismatic. Note that the side chairs are busy but still neutral and calming. Notice the color scheme is stunning. Kyle Hunt & Partners, Inc. 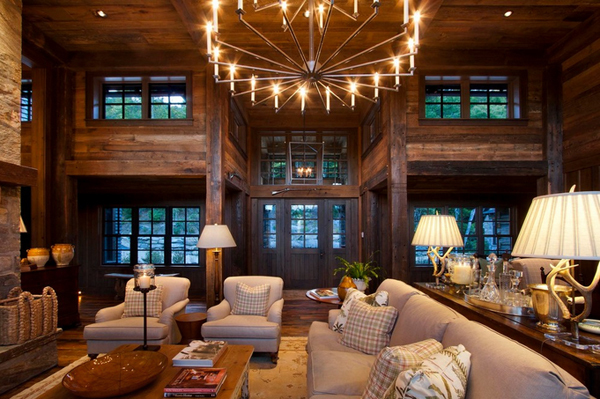 I like the French features – especially the wood beams. 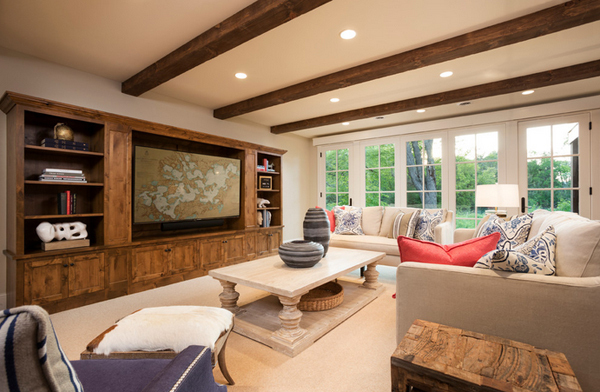 Notice the beautiful lighting fixture on the ceiling in this family room. French provincial furniture was an inspiration for this look. 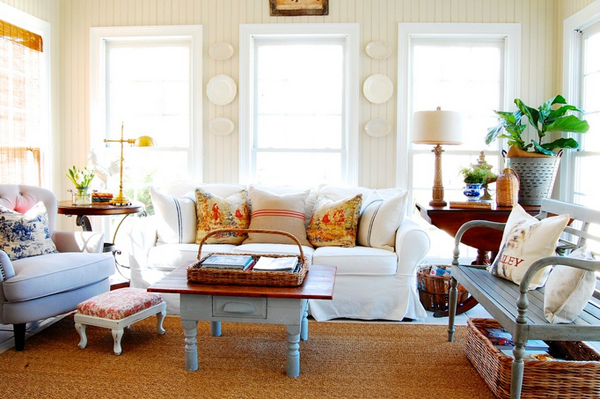 Pillow patterns are borrowed from French country decor. 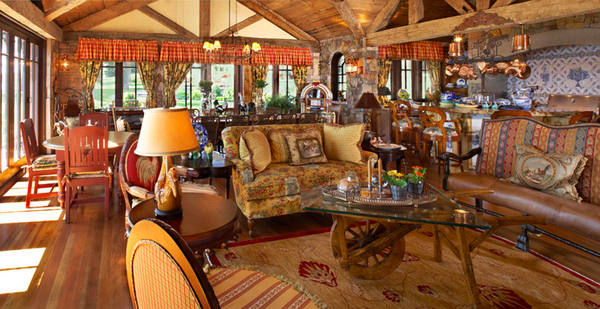 There is plenty of seating for guests, children and grandchildren as they gather for the holidays. I like the paint color and clocks. The rest is not my style but somehow works and looks cozy. In the living room, French country antiques are combined with contemporary flourishes – like antler lamps mounted on Lucite – that offer a respite from all the rusticity and make the space feel lighter and fresher. If you want privacy as well as light, a natural woven roman shade might fit the bill. If your space has multiple doors, a woven shade will not only let the sun through and keep the space relaxed and neutral. 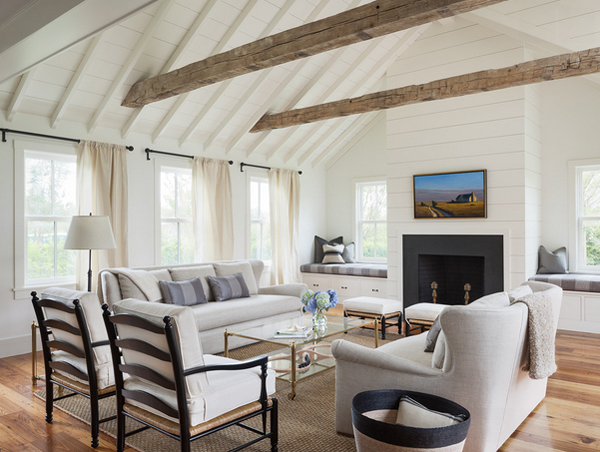 This living room looks like Emily Thorne’s beach house and Victorian Grayson’s manse mixed together – it’s time for some Revenge. I’m thinking gazpacho, because whatever you’re making, you should serve it up cold. 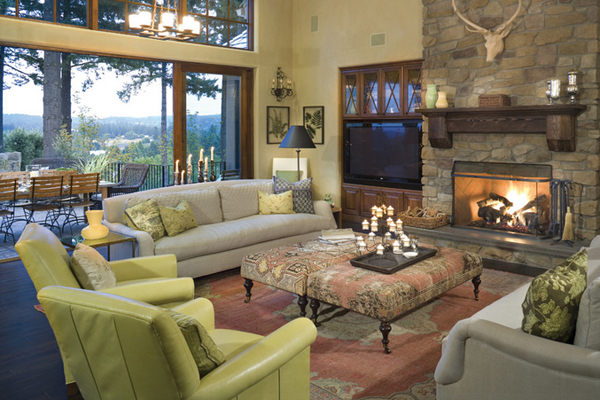 A thoughtful balance is achieved in country French style that provides an elegant stage for casual living. To accomplish this, dress the room with French influences, such as full-length draperies, rich wallpapers or paint finishes, and formal fabrics. Then fill the space with livable furnishings, such as this generous, farmhouse-inspired dining table, to entice large gatherings of family and friends.